This active singles vacation has something for everyone. 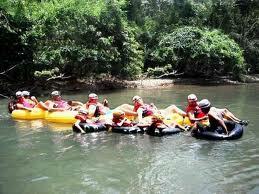 Explore jungle ruins and float down rivers while discovering the secrets of the ancient Mayans. 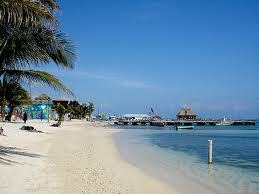 Then leave the jungle behind as we boat to Ambergris Caye. Relax on the beach, snorkel, dive or drive a golf cart around the island. 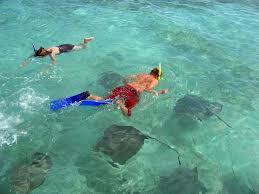 You can do it all on this Belize Jungle and Beach singles vacation. Your vacation begins upon arrival at the Belize airport (airport code BZE), where you will be met by our local driver. Arrive early and spend the day at Bacab Eco park (only 15 minutes from the airport). Relax and enjoy nature while waiting for your fellow vacationers to arrive. The Bacab Eco Park has a magnificent free-form pool, sculptured waterfall, restaurant and bars, all smack in the middle of the jungle. Take a self guided tour through the medicinal trail and learn the basics of the healing plants in the area. Visit the Wild Wings Butterfly House, a winding pathway offers the opportunity to view as many as 25 species of native Belizean butterflies in a kaleidoscope of colors. 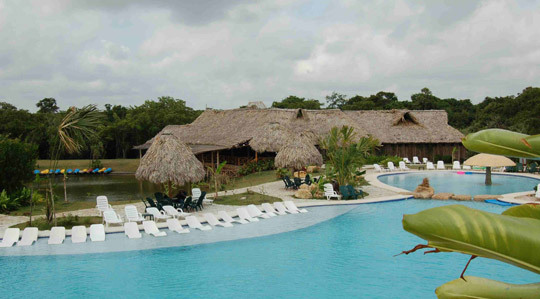 Once all travelers have arrived we will travel as a group to San Ignacio and our resort. Tonight we will relax and enjoy our Welcome Dinner at Windy Hills resort. Today we travel to the Mayan City of Caracol and its massive temples "Caana", which cover 30-square miles of thick, high-canopy jungle, five plazas, an astronomic observatory and over 35,000 buildings. 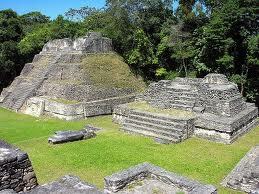 Caracol boasts several hieroglyphic carvings on alters, a ball court and capstones. Among the recovered items are a ritual mask and ceremonial altar. The excavation at Caracol is still ongoing. Next we cool off in the pine forests, tumbling streams, lush river valleys, caves and waterfalls of Mountain Pine Ridge. After a quick hike, view the breathtaking sight of the 150 foot intense rush of white water calming into a large swimming hole at the Big Rock Falls. Then we move on to Rio on Pools to enjoy a wide span of naturally formed pools and cascading falls. The most popular of the waterfalls is the Hidden Valley Falls, a spectacular fall that drops 1500 feet to the valley below. Tonight we will have dinner at our hotel. This amazing day can best be described as an "Indiana Jones" type experience. The ATM cave tour promises a thrilling experience with impressive stalactites and stalagmites rock formations coupled with Mayan pottery, undisturbed after hundreds of years. As we travel from San Ignacio Town hear stories of Mayan Gods and see ancient passage ways, and evidence of a Mayan princess burial scene. Actun Tunichil Muknal consists of a series of chambers, ending in a 300 by 50 meter Cathedral where sacrificial ceremonies once took place. We will be exposed to the individuals sacrificed to the gods of the underworld. This ATM Cave Tour offers us the opportunity to travel into the Maya past and witness a living museum where human sacrifices and artifacts can be viewed in their original context. 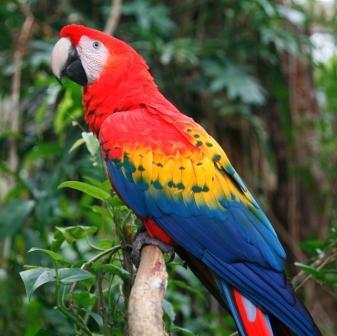 Prefer a less active day then visit the Belize Zoo and Tropical Education Center. The zoo is situated upon 29 acres of tropical savanna and exhibits over 150 animals, representing over 45 species, all native to Belize. They keep animals which were orphaned, rescued, born at the zoo or rehabilitated animals. A visit to the zoo is the best way to get an introduction to the animals of Belize, and to understand why it is important to protect the habitats that sustain them. Tonight we will go into the town of San Ignacio, connected by the Hawksworth Bridge to its twin town Santa Elena, San Ignacio is the largest town in the Cayo District .There will be free time for dinner and shopping. Today we experience two of Belize’s most popular attractions, cave tubing and ziplining. 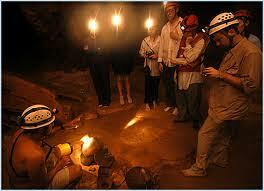 Gently cruise down the Caves Branch River System into an underground cave used by ancient Mayas. Within these vast caverns witness incredible formations of stalactites and stalagmites some shaped like human and wildlife figures. Our day will also include a forty minute hike through the jungle. Our zipline adventure begins with a short hike through the Belize rainforest to the base of the starting platform. There we climb up to the top of the first platform where our guides assist us in connecting the overhead cable to begin the first of 7 zip runs. The first, "beginner's zip run" is a 150 feet long and the next six zips range in from 200 to 600 feet between treetop platforms. Enjoy dinner at our resort tonight. After breakfast we leave the jungle behind and travel by boat to Ambergris Cayes, known for being a true Caribbean playground, where our vacation continues. The island features the Belize Barrier Reef, the second largest in the world with world class scuba diving and snorkeling. After checking in to the Sunbreeze Resort, we will stroll into San Pedro town. The town is a picture postcard setting - small colorfully painted houses set alongside sand streets nestled beside the clear turquoise sea. Coconut palms sway and rustle in the gentle cooling trade winds. Golf carts and bicycles are the principal mode of transportation. The streets are home to local and visiting barefoot strollers, casually making their way through the shops and restaurants or just relaxing and chatting with the locals. Our morning excursion takes us off the southern tip of Ambergris Caye to Belize’s oldest marine reserve, the Hol Chan Marine Reserve. 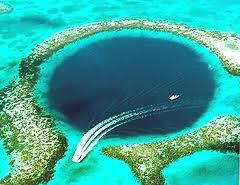 The entire reserve focuses on a cut through the reef which is little more than 25 yards wide and 30 feet deep. Over 160 species of fish have been identified at Hol Chan & Shark Ray Alley, along with nearly 40 species of corals, 5 sponges, 8 algae, 2 sea grasses, 3 marine mammals and 3 species of sea turtle. In waters as shallow as 5 feet, large schools of jacks, groupers, snappers and barracuda abound. Along each side of the cut grow healthy stands of corals and sea grass in shallow water, perfect for the beginner snorkeler. The more experienced swimmer can swim from one side of the cut to the other, experiencing shallow reef, drop offs, sea grass and sand beds in the middle of the channel. Let's try something different and take a quick and smooth ride to some of the best fishing grounds off Ambergris Caye. All our equipment and bait will be provided. The local guides are always willing to assist you and help make our day of fishing fun. After fishing we head towards the nearest snorkel stop before heading ashore. Afternoon free to enjoy the beach or last minute shopping in San Pedro. Then enjoy our Farewell dinner together this evening. Sad to say that our Belize Jungle and Beach vacation has come to an end. According to individual flight schedules you will be transferred to the airport for your domestic flight to the Belize International airport. the amenities of Windy Hill. 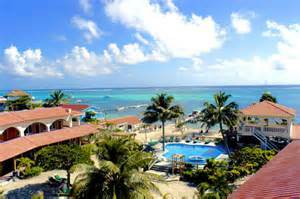 Sunbreeze Hotel, Delux Rooms - located in Ambergris Caye, features an outdoor pool and free Wi-Fi in common areas. This hotel offers air-conditioned rooms, tiled floors and mahogany furniture. Each comes with a flat-screen cable TV, a work desk, hair dryers, in-room safe, a mini refrigerator, a ceiling fan and a private bathroom. All Rooms are non-smoking.